Amazon’s new Blu-ray releases this week are discounted at least 30%, according to a newsletter from the company. 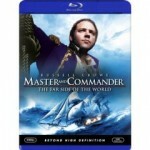 Among this week’s new releases are: “Master and Commander: The Far Side of the World”, “The Chronicles of Narnia: The Lion, the Witch and the Wardrobe”, “Shinobi – Heart Under Blade” (Special Edition)”, “Untraceable”, and “Twister”. Coming soon to Blu-ray Disc are: “There Will Be Blood”, “Cloverfield”, “National Treasure / National Treasure 2 – Book of Secrets”, and “Short Circuit”.